Construction Site Parking Signs are ideal for clearly marking which areas are suitable for parking and which are not, as well as making sure your directions remain visible at all times. It may be the case that your regular employees know the correct parking procedure, but visitors, subcontractors and members of the public may not know of the rules to be followed or the dangers of parking in the wrong place. If a vehicle is found to be parked in a crucial spot, construction workers may have a hard time reaching a destination, or they might have to keep dodging the vehicle if it's parked on a path they're traversing often. This not only can cause serious safety concerns but it can also have a negative impact on everyone's productivity. By using clearly visible signs you can help to ensure the smooth operation of your workforce as well as staying compliant with local laws and regulations. Parking Signs are an important factor in helping you achieve a safe and efficient flow of vehicles and pedestrians on your site. These signs may not be as critical as our other Construction Site Safety Signs that serve to remind us of the dangers you might encounter on a construction site, but are quite important regardless, since they give crucial guidance which can help to ensure accidents to vehicles or people are less likely to occur. Avoid risks - The use these signs of is not only in the best interests of construction site owners, but the vehicle owners as well. This is because you never know what can happen there. After all, construction sites are classified as dangerous areas, and leaving your vehicle there for too long may subject it to unnecessary risk. For example, someone might accidentally hit or scratch it, or perhaps an object might fall from a higher platform and cause significant damage to the vehicle. Part of a complete safety program - By combining signs enforcing parking rules with other signs, you can help to ensure that all employees, visitors and members of the public are kept safe and create a productive work environment. Our Construction Site Information Signs can help to further explain the reasons behind the rules in force and our Construction Site Hazard Signs can warn of any potential dangers and prevent accidents from occurring. 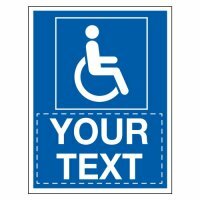 Simple to understand - Whatever message you are trying to convey to those parking on your site, it’s important to make sure that your signs are easy to see and understand. All of our signs feature a stark contrast of colours between the background and the foreground, which means they're highly visible even in dimly lit areas or complete darkness. Leave no doubt - The clarity of your notices is crucial in allowing you to enforce special parking procedures. For example, there may be areas where parking should not be allowed at all, perhaps in an area where heavy vehicles need constant access. In this case a “No Parking” Outdoor Aluminium Sign can deter any vehicles thanks to the widely recognised symbol of a red circle with a line through. Prevent misunderstandings - It could also be the case that certain areas are reserved for your regular employees and should a space be wrongly taken it could cause issues later in the day. A “No Parking For Subcontractors” Sign can make it obvious that the area is not to be used by unauthorised users. Clarify responsibility - By setting up “Car Park Risk/Responsibility For Damage” Signs, you let the people know that leaving their vehicle on the premises is their own decision, and that you won't be assuming any kind of responsibility in case something happens to it. The right location - Making sure your signs are in the right position to begin with can make all the difference when it comes to their effectiveness. Our range of Sign Fixings solutions are designed especially for that purpose, allowing you to ensure that your signs are securely fastened whether for temporary or permanent use both indoors and out. Superior construction - Our signs are made from durable materials that are fully compliant with current regulations, including our glow-in-the-dark material options, designed to be very noticeable and easily visible, even in dimly-lit and darker areas. Fully customisable - If you find that our selection of signs doesn't quite match up with what you need for your particular construction site, you can always take advantage of our Custom Site Safety Signs designer to create a sign that features any text, images, symbols or even company logos that you require.